Cornell University researchers have discovered that it is possible to alter plant flowering time and other traits by manipulating soil microbial communities, a finding that they ultimately hope will help reduce crop inputs on everything from greenhouse plants to agronomic crops. “For example, if we can give grass a competitive edge over weeds by enriching the soil with microorganisms that provide benefits only to the grass while suppressing the growth of other plants, it will give us another tool to grow high-quality turf without resorting to chemical weed control,” says weed specialist Jenny Kao-Kniffin, assistant professor in the Horticulture Section of Cornell’s School of Integrative Plant Science, one of the study’s authors. Developing such tools is particularly important with the 2010 passage in New York of the Child Safe Playing Fields Act – and similar laws in other states – that prohibit pesticide applications to playgrounds and athletic fields at schools and daycare facilities, she adds. The study, Selection on soil microbiomes reveals reproducible impacts on plant function, was published October 28, 2014, in The ISME Journal, and has been in the top ten of articles downloaded at the journal’s website for weeks. 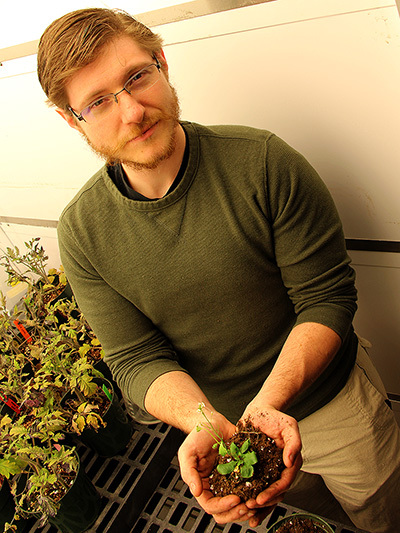 The study’s lead author, Kevin Panke-Buisse, a Ph.D. candidate in the Graduate Field of Horticulture, used a single genotype of Arabidopsis thaliana to develop two different soil microbial communities. He grew the plants for 10 generations, harvesting soil each time from early- and late-flowering plants to inoculate the soil for the next generation. “By using seeds from the same Arabidopsis genotype – keeping the plant genetics the same from generation to generation within an inbred line – we were able to verify that the differences in flowering time were due to differences in the microbial inoculants alone,” he observes. When Panke-Buisse then used the resulting inoculants to grow additional Arabidopsis genotypes and a related mustard-family plant (Brassica rapa) — an important agronomic crop — he found that the soil inoculation continued to either delay or accelerate flowering with these different plants. Analyses showed that the early-flowering soils were dominated by bacteria from families associated with decomposition and nutrient mineralization. The late-flowering soils were dominated by different bacteria families known for promoting plant growth. “But the greatest differences we saw were in the presence or absence of relatively rare bacteria, suggesting that they could play a big role in controlling flowering time despite being in low abundance,” Panke-Buisse notes. Later flowering plants also saw a 50 to 100 percent increase in biomass. “If we can harness soil microbes so that we can enhance grass density and shade out competing weeds, it should go a long way to help us reduce herbicide use,” he adds. Panke-Buisse and Kao-Kniffin plan to further investigate how soil microbes affect other plant traits and apply what they learn to other horticultural systems.